Discover the largest selection of promotional products anywhere, featuring 15,000+ high quality promo products, from ePromos. Apparel & Accessories - Whether you're launching a new marketing campaign, prepping for a day on the golf course, or suiting up the company softball team, ePromos brings you everything you need to outfit your organization in style. Make your next company outing or event soar with the best promotional items and apparel, featuring custom screen printed or embroidered golf shirts, polos, button downs and tees, outerwear, team uniforms, footwear, sleepwear and sweats. Shop a customizable collection of accessories including tote bags, caps and hats, watches, scarves, ties, bandanas, awareness bracelets and rings that will boost your company morale and brand awareness. Drinkware, Food & Candy - The way to their hearts is through their stomachs. Treat them to sweet and savory treats that are ideal for any giveaway or corporate gift-giving occasion. Stock up on imprinted promotional products such as custom candy and gum, promo mints, nuts, wine sets, logo chocolate, coffee gifts, bottled water, and more memorable edibles and snacks that can be personalized with your company name and logo. Provide them with drinkware that will allow them to drink on the go with promo mugs, logo water bottles, custom glassware, thermoses, cups and koozies. 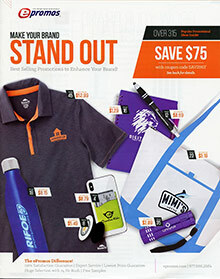 Auto & Home - Shop a functional collection of imprinted promotional products that they'll love bringing home. Improve their daily commute with an assortment of automotive accessories including key chains and car wash equipment, sun shades, floor mats, tools and flashlights. Gift them with items they'll use on a daily basis, such as kitchen products and utensils, organization and storage items, pet themed products, bag clips and book lights, grilling gear, and more practical housewares that they'll use in every room, from the kitchen to the garage. Technology - Wow them with the latest innovations in technology with a tech savvy selection of gadgets that will show off your branding while catering to their love of everything electronic. Choose from USB flash drives and computer accessories, Mp3 players, travel electronics and adapters, cell phone accessories, calculators, speakers, PDA cases and wallets that are all available for custom logo imprint. Office & Desk - Find a 9 to 5 supply of custom office supplies and desktop accessories that will keep you in business. Browse an extensive selection of workplace basics including promo pens and post-its, mouse pads and magnets, business card holders, letter openers, desk organizers, picture frames, plants, paperweights, paperclips, and more desktop prerequisites that can be customized with your company logo or artwork. From polo shirts and promo pens to toys, treats and tradeshow supplies, you'll find the best promotional items and merchandise to choose from, all paired with an everyday low price guarantee. If you can find a lower advertised price within 30 days, ePromos will not only give you a check for the difference, they'll also give you $100 off your next order.